Family Father: Hal David Caywood was born on April 17, 1903, in Santa Barbara, CA. He died on December 11, 1978, in Santa Barbara, CA, at 75, and was buried in Chico, CA. Mother: Velma Alverta Harris was born on July 25, 1905, in Chico, CA. She died on June 3, 1999, in Chico, at 93, and was buried there. Hal Dee Caywood was born on November 22, 1932, in Santa Barbara, CA. He was married on November 30, 1958, in Spokane, WA. He died on May 26, 2010, at the age of 77. Gary Caywood grew up in a Navy family, and was raised all over the country. He graduated from high school in Spokane, Wash. After his graduation, his parents moved to Chico. 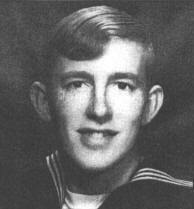 He enlisted in the Navy in February 1967. Caywood planned to be a physical therapist after his Navy stint, so applied for hospital corpsman school. After boot camp he trained at Balboa Hospital in San Diego. The Navy provides medical care for the Marine Corps, and enlisted hospital corpsmen act as battlefield medics. So in mid-April 1968 Gary Caywood was shipped to Vietnam with a company of Marines. He lasted just 16 days. On May I, 1968 in Quang Tri Province. Caywood’s unit was shelled with mortars and he suffered a direct hit. He is buried in Chico. Gary S. Caywood, 21, Son of Mr. and Mrs. Hal D. Caywood, of Chico CA, and a 1966 graduate of North Central High School, in Spokane WA, was a Naval Hospital Corpsman, 3rd Class assigned to the Headquarters and Service Company, 4th “Oldest and the Proudest"/"China Marines" Regiment, 3rd Marine Division, 3rd "Fighting Third “Amphibious Marine Force, at the time he was killed. He had been in Vietnam 15 days when he died of shrapnel wounds sustained from enemy mortars during "Operation Fortress Attack" in Quang Tri Province.